Somebody once asked what I mean by translation of records when I said I had to translate a lot of source documents for my family. Good question. Yes, it is true that I am Polish, so is absolutely everybody in my family and I am yet to find an ancestor who moved abroad. You might then ask yourself: what need is there for Translation? Surely but life is hardly ever normal. I am as Polish as it gets: born and bred there. I come from long line of Polish farmers who quite often never even left a parish, never mind the country, BUT as Poland is situated right in the centre of Europe it was regularly turned into a battlefield. From the establishment of Poland in the Middle Ages, there was war after war after war. The land was invaded pretty much by any neighbouring nation and some from further afield as well, until the point in the eighteenth century where Poland ceased to exist altogether – on the map of Europe that is. The country was divided between Prussia, Russia and the Austro-Hungarian Empire. Different laws and prohibitions were in place depending on the region (with Galicja enjoying quite liberal attitudes) but, generally speaking, using the Polish language was discouraged and then by the late nineteenth century, it was replaced by Russian and German respectively. There are many examples of Polish people fighting to save the language and culture. 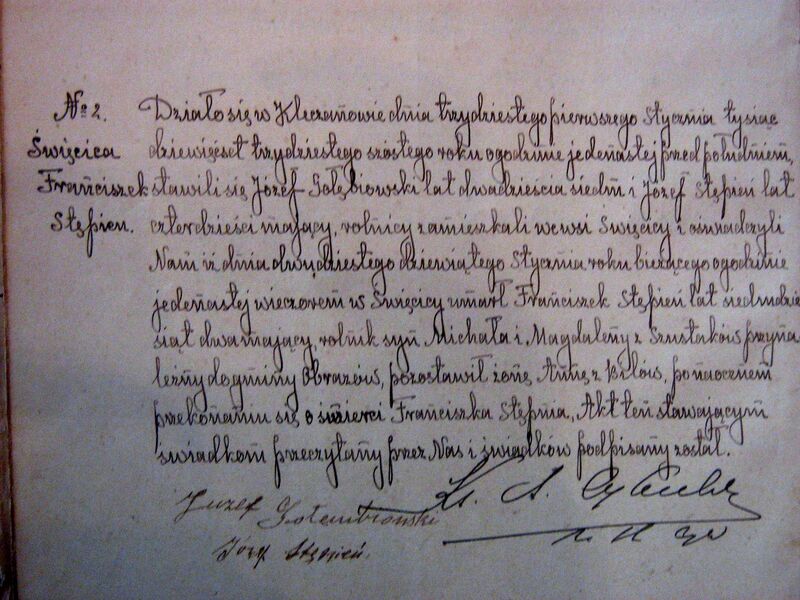 What does it mean for me or any other genealogist searching for Polish roots? It means that records are written in a different language. In my case, every record starting from 1868 is written in Russian (if I am really lucky there is a Polish name in brackets pic.1). Because of politics and geography, a good part of my family records have to be translated even though all the ancestors I found to date lived in one district and spoke Polish. If you remember that the concept of a civil register was only introduced in Poland at the end of the eighteenth century and the first civil registers were completed by priests alongside parish records then it is reasonable to expect that most older church sources are written in Latin. I was lucky enough to learn Russian at school although my choice of words here could be problematic as the Russian language and culture, visible everywhere in communist Poland, was hardly a reason for celebration. I also spend long hours learning Latin as a part of my MA in Archaeology, so I consider myself well equipped to deal with what my genealogical research throws at me, but I can just imagine the frustration of other people with Polish roots when they discover that even knowing Polish is just not enough to be able to trace their Polish ancestors. This entry was posted in English, sources and tagged family history records in Poland, history of Polish vital records, translation of genealogical sources on 3rd August 2015 by Jolanta.